The models of the chief designer Nikolay Buzov were rated as “exclusive” not only by the numerous clients, but by the organizers and partners as well. Eminent specialists classified the style and the quality of Markam Fashion among the highest segment of those who influence the fashion trends. 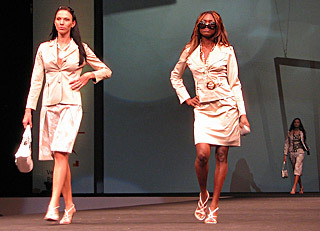 The organizers chose the Bulgarian company to open up each and every cat walk shows. The participants of these spectacles were well known brands like Monnalisa”, „Olsen Fashion”, OP Prostejov Profashion, Rialto, BP Intercom, Dominator and H&D. The models of Markam made an impact strolling down the catwalk with their very high class and were met by the audience with laud emotional applauses. “The design and the style of Markam Fashion are as chic and classy as “Cavalli” , was the opinion of a Greek boutique owner, who will soon visit the premises of the Bulgarian firm to place order for some special elegant models. Orders were placed also by renowned professionals from all large cities and holiday resorts in Czech Republic. Five Czech wear shop-chains declared their wish for exclusive distribution of Markam. Markam granted the privilege for selling rights in Prague to “Downtown Fashion” company. In the beginning of September Downtown will open a shop on one of the main streets of the capital, where only the collections of Markam will be sold. The shop will offer first the Autumn / Winter 2007/08 collection, which will be presented to the public in 2 spectacular cat walk shows on the 13.09.07 and on the 20.09.07 at the five star “Savoy” hotel in Prague. Among the invited guests are diplomats and VIP representatives from the business and vogue high class. Prerogative for selling Markam in Poland, Hungary, Slovakia and Romania was requested by a Hungarian company, who had surveyed the Bulgarian brand more than a year. Markam Fashion will continue the presentation of the Spring 2008 collection at the fairs CPM in Moscow and BGate in Sofia, where the new Summer 2008 collection will be shown for the first time.